» Forum » Market » Buying and selling advice » What Is The Value Of A VACATION AMERICA? » What Is The Value Of A VACATION AMERICA? What Is The Value Of A VACATION AMERICA? i predict this pin is going to become a running joke, much like BBH and WPT. I guess you've never played one. 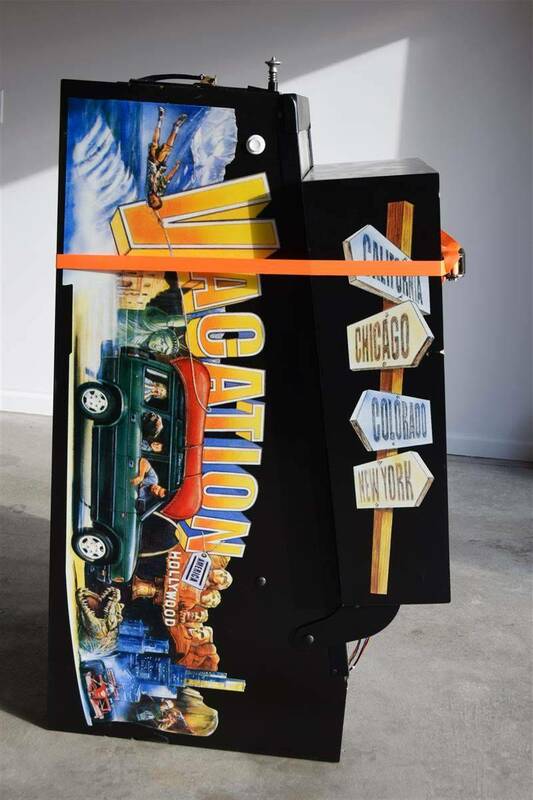 It humors me that Vacation America is linked as a game made by Chicago Coin. I am guessing they will also get credit for MMr when the time comes. I see no UL markings on it. I had one years ago, for a non pin person it is just fine. I think we sold it for 400 bucks. Luckily, I'm still saving to put an Orbitor 1 in my collection and not some weird "experimental" machine. I've found after a handful of mushrooms, Orbitor 1 plays exactly like TX-Sector. I saw that. Pretty neat and not a title you see a lot. Where's porkchop express when you need him? I have to admit I like the art in a goofy way. I dig old SUVs like the Rangr Rover and love highway signs. 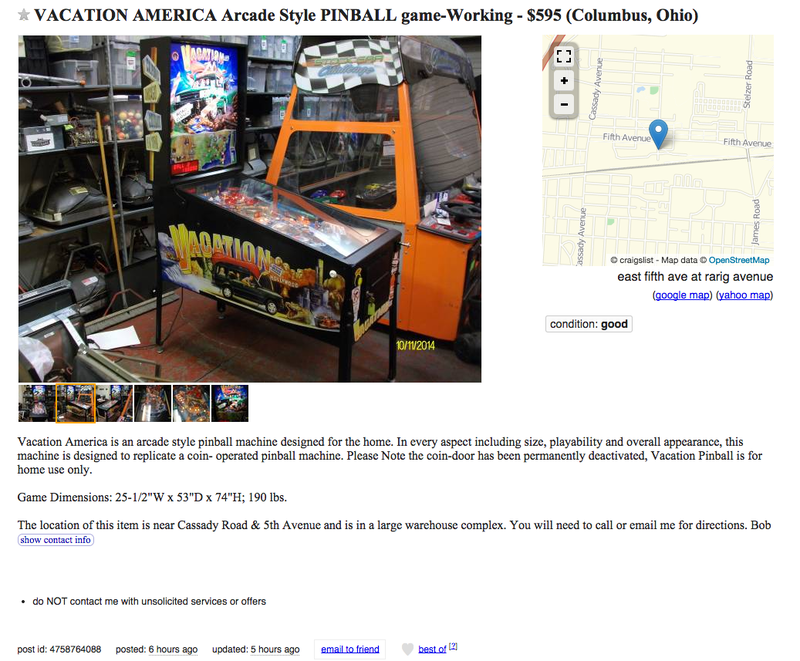 I would be interested in the IL one if it was next door because I have almost zero pinball budget. Did any notice the ol' lady in the background looking like you are selling What? Is that the same one? The pics looked different I thought. That's what I thought. Pretty crazy huh? $600, working in good condition. Less than $450, if the game does not work. Less than $250, if the game does not work and is trashed. Game is repairable, but generally not worth the time and effort. I picked up the Vacation America for 500 yesterday, so you know. It's my first machine and frankly, my young sons and I are having a pretty good time with it. Everything seems to be in nice condition although all the criticisms of the machine seem pretty valid. My ideal machine would be Indianapolis 500, but I can't justify spending 4,000 dollars. Anyway, I have noticed an annoying problem...when I attempt to get multi ball going and lock the 2nd ball in the upper kick-out, the machine doesn't doesn't give me a new ball. It seems like a software bug or something because the upper kick out works before the multi ball light is lit. Not sure what to do and it's frustrating since multi ball is the most fun thing and I haven't been able to initiate it yet. I have to turn the machine off and back on again for the machine to kick out the ball and give me a new ball. Frustrating. Any ideas how to fix? Looking forward to all the shots I am going to take for buying the worst pinball machine ever, but hey, at least I own a pinball now! VA is no where near the worst pinball machine ever made. Dozens are ahead of it in the diarrhea running. You can get a good I500 for under $2600. You can get a superb+ one for $3200, restored. I know where one is right now for sale. If you have the cash, I would buy it as this game is on the rise as a B Title. 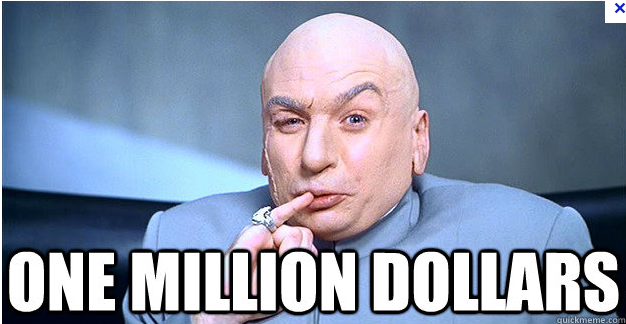 The release on Pinball Arcade is going to acclerate the pricing, as many have never played one. I own one, and people go, "WTF is that?" 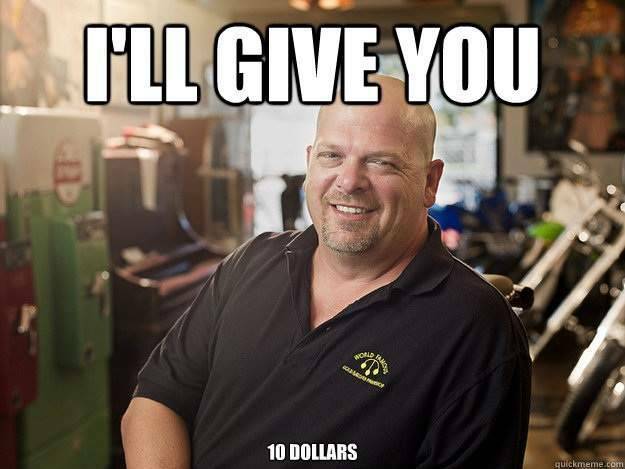 I'd like to shop in your market. Good i500 for under 2600? Yes please. Reduced to $800, and its quote, "collectible!" I live 10 miles or so from this.. I considered going to play it just for the fun of it, but I'd be worried I was the only one who showed any interest at all, and they try to get me to buy it. 1) I'd only give them maybe $75 for it, and I have ABSOLUTELY no room for another game presently. I can't even walk around in Flipper Control presently! It's a pretty neat layout. If someone did a rules rewrite, it could be pretty good. The construction is pretty solid. Saw a mint one in my area for $500 several months ago.... I passed, though had thoughts of trying my hand at a re-theme. Bad layout, horrible display, odd oversized black box, terrible art, clunky shots, close to zero code. Anyone got better PF pictures than the ones posted on IPDB? I doubt anyone would come forward for risk of public shame. I played one and have to say its not the worst game I have played. Well, it sure does make any game you put next to it look pretty good. So it has that going for it! Bumping an old thread as I just saw one of these pop up for $500 in Indianapolis. Not interested myself but figured someone may want an ugly duckling. 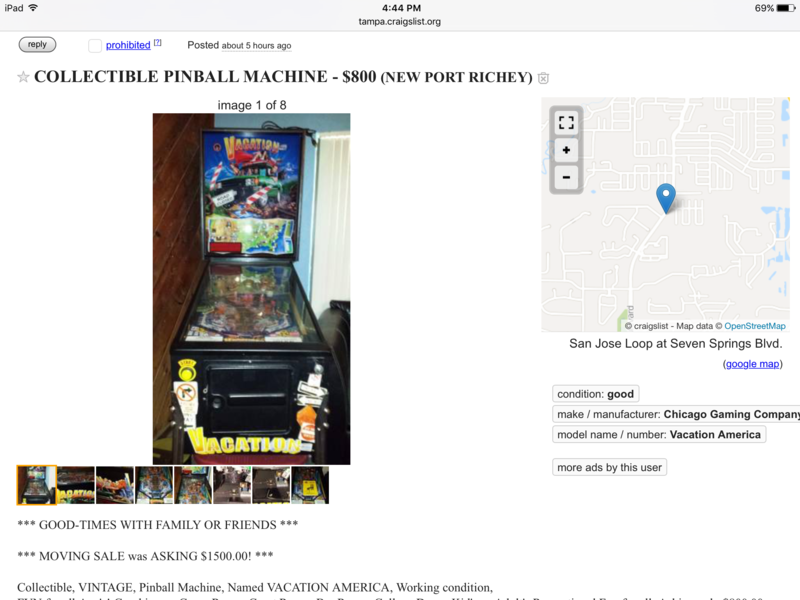 "Sought after by pinball collectors, as was only a limited run." I've never played it, but it's obviously a better deal than the $1800 one in PA. I might know a guy - unfortunately.